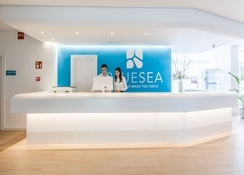 Blue Sea Hotels & Resorts’ Gran Playa Aparthotel is located at the heart of Sa Coma on the island of Majorca in the Balearics. This 3-star aparthotel is a wonderful, family-friendly accommodation, offering comfortable stay and impeccable services to its guests. Just steps away from the Sa Coma beach, it welcomes guests with world-class amenities, warm hospitality and stunning views of the surrounding areas of the island. With two large swimming pools, sun terraces, expansive garden and proximity to the Sa Coma beach, this is a popular beachside retreat for fun-seeking travellers to the Balearics. The well-appointed one-bedroom apartments and studios come with a range of staying options, including an all-inclusive bread-and-breakfast package and a half-board option. 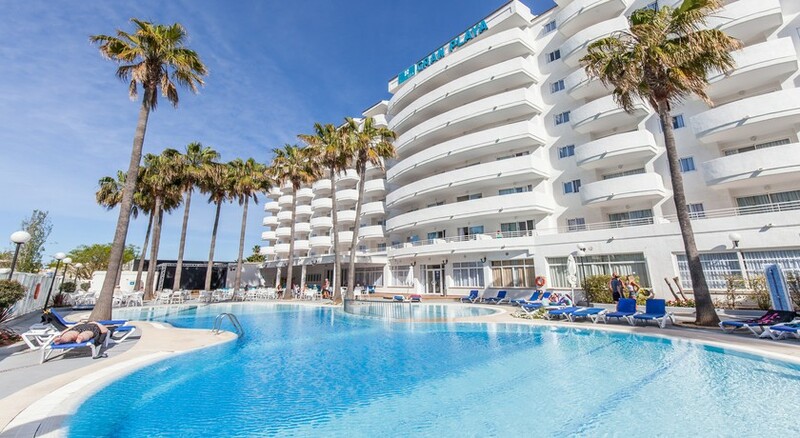 Blue Sea Gran Playa Aparthotel is literally steps away from the beautiful Sa Coma beach. All the city attractions, restaurants and bars are within the walking distance from the hotel. Spas such as Cleobell Massage & Kosmetik and Cala Sa Nau can be found near the hotel. Similarly, good restaurants such as Es Moli d’en Bou, JJs Restaurant and Bar, and Beachside are also a stone’s throw away from the establishment. 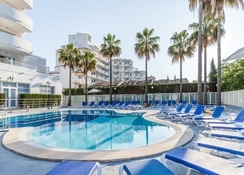 The nearest airport is Palma de Mallorca, which is about an hour’s drive (60 km) from the hotel. The Blue Sea Gran Playa Aparthotel has 111 one-bedroom apartments offering a bedroom, a living area with a sofa bed and a kitchenette. It also has 28 studio apartments. 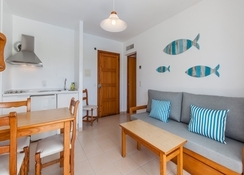 The rooms have air conditioning, satellite plasma TVs, hair dryers, Wi-Fi facilities and private balconies or terraces. There is also a fully equipped kitchen area, along with a safe and an en-suite bathroom with premium bathroom products in each of the rooms. 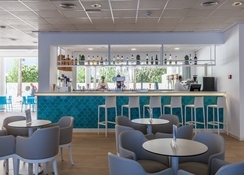 The main restaurant of the hotel offers an international buffet with a large array of cuisines, including Majorcan delicacies. It serves all the major meals of the day in a fine-dining ambience. There is also a pool bar and a cafe bar, both of which have a nice collection of refreshing drinks and finger food on the menu. Guests can choose from a range of alcoholic and non-alcoholic drinks, plus snacks and fruit to gorge on. The Blue Sea Gran Playa Aparthotel has an array of amenities for the relaxation and recreation of guests. There are two fantastic outdoor swimming pools with a separate children’s pool, plus an expansive sun terrace to lounge on. There’s a playground and a kids’ club for children as well. The hotel also organizes a range of activities and shows available day and night for adults and children. There is also a separate games room. Water sports activities are available on the Sa Coma beach, which is just a stone’s throw away from the hotel. American Express, Visa, Euro and Master card are accepted. During the works of refurbishment hotel will remain closed for clients. Hotel will open for summer 2018, according the dates stipulated in the contracts. Standard Apartment Balcony or Terrace Economy APSD0000AE is located in the Annex Building with kitchenette and not reformed. Standard Junior Suite Balcony or Terrace JSSD0000A0 without kitchenette and reformed. Standard Room Balcony or Terrace RMSD0000A0 without kitchenette and reformed. Lovely friendly hotel, clean and modern. One thing that lets this hotel down is the lunch time snacks. Central to amenities, close to the beach. We had a fantastic time at the Blue sea gran playa and plan to return in summer 2019. We could not fault the hotel for cleanliness, it's location and friendliness. The food was varied and plentiful the drinks were a bonus as we went all inclusive and there was plenty of selection with good measures. The atmosphere in the hotel was lively and the entertainment was directed towards adults which is lovely for a change compared to places we stayed before. Our room was a great size and spotless. It was very modern and all in all for the price we paid way above our expectations!! The staff and animation team at this hotel made my stay a top 5* STAR, they were so welcoming and engaging , loads of fun. The rooms were beautiful designed and very comfortable. The food was the biggest let down with barely any choice to choose from, especially for those with dietary requirements. Overall, had an incredible holiday. We had our first family holiday abroad here in September for my 50 birthday. The hotel was clean food was great. Entertainment really good. Rooms cleaned daily. A lovely surprise from management on my birthday. Everything was spot on. People. Hotel. Location. Bars. Restaurants. Had a fantastic holiday, the apartments were lovely. Staff were all very professional and the hotel it’s self was very smart and clean. Massively enjoyed our stay and will certainly come again.